During his hour-long news conference and series of media appearances following his meeting with North Korean leader Kim Jong-un on Tuesday, President Donald Trump didn’t hesitate to defend and even praise the dictator, who’s best known for his record of brutal human rights violations that involve starving his people, running a ruthless police state, sexual violence and even ordering the murder of members of his own family. Addressing the inhumane acts by the Kim regime during a press conference Tuesday in Singapore, Trump told reporters that “all I can do is do— what can I do? We have to stop the nukes,” vowing that those who have been tortured and held in gruesome captivity would be the “great winners today.” That is, if Kim breaks with his family’s record of breaking promises with the U.S. to denuclearize the peninsula. He then claimed the two sanguine leaders really, actually do trust each other, despite what you might have heard: “I do trust him, yeah,” Tump said. “Now, will I come back to you in a year and you’ll be interviewing and I’ll say, ‘Gee I made a mistake?’ That’s always possible. You know, we’re dealing at a very high level, a lot of things can change, a lot of things are possible. Trump continued his gushing over Kim well into Tuesday afternoon, making his most complimentary comments about Kim to Van Susteren, who asked him, point-blank, whether Kim actually loves the people he starves. “Really, he’s got a great personality. 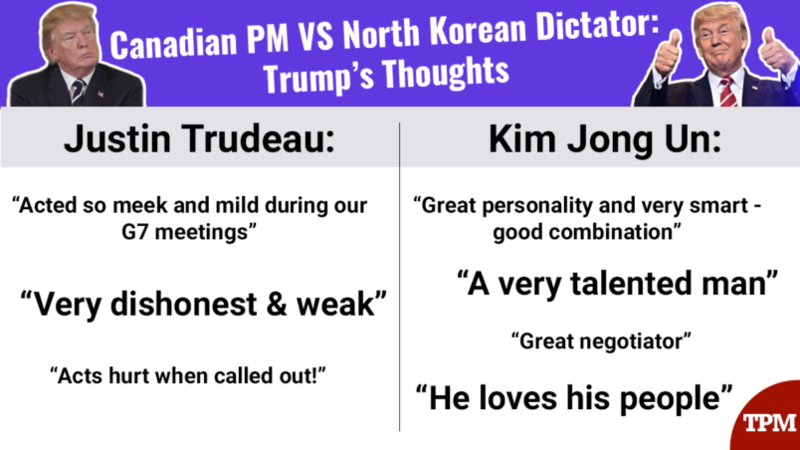 He’s a funny guy, he’s very smart, he’s a great negotiator. He loves his people, not that I’m surprised by that, but he loves his people. And I think that we have the start of an amazing deal,” Trump said. Before the full interview airs during Hannity’s show on Tuesday evening, the hosts of “Fox and Friends” teased some of Trump’s initial comments. Trump told Hannity that he and Kim “got along very well” right “from the beginning,” which was better than he assumed. The President also walked back the name-calling he engaged in with Kim in recent months — when he dubbed him “little Rocket Man” and claimed his nuclear “button” was bigger than Kim’s — sheepishly calling the comments “foolish,” but necessary. That segment of “Fox and Friends” ended with Hannity cajoling Trump for his skills in reading people.